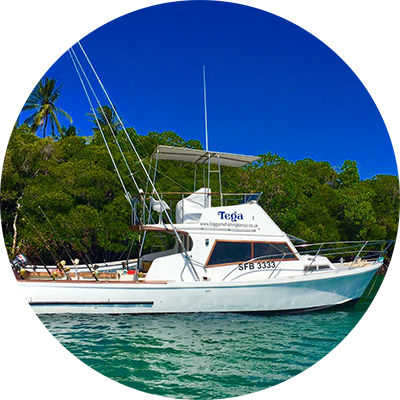 Our 1st boat is a 33 foot Aquabell Sportfishing Diesel powered vessel ideal for 4 anglers who want full day offshore and overnight trips out to the North Kenya Bank. She is powered by 2 X 325 HP Perkins Sabre diesels and fitted with the latest Furuno sounder with 1KW transducer and Lowrance GPS plotter. 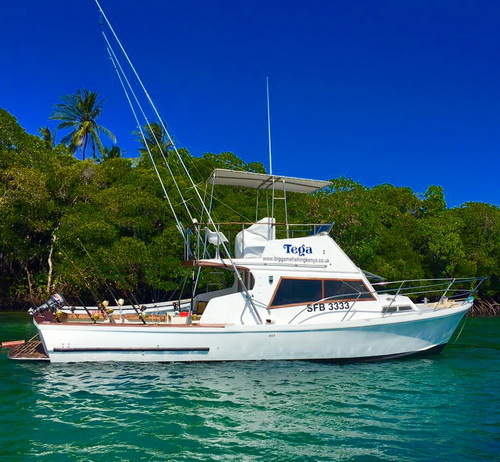 She has comfortable bunks down below and a fully enclosed and protected cabin. Ample shaded seating and a wide cockpit, unobstructed fishing deck and a fighting chair. She has spreader type outriggers and a down rigger and carries full safety equipment as well as a 6 man life raft. Tackle consists of Shimano TLD 25's & 50's, Penn International 30's & 50's & Shimano Tiagra 50's & 80's. 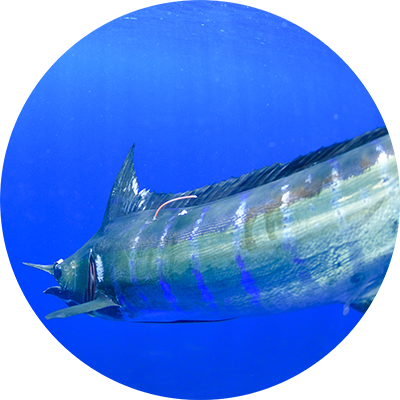 We troll Pulsator and Fathom lures and have a huge selection of colors and designs to choose. Pls note that we do not provide jigging or popping gear. 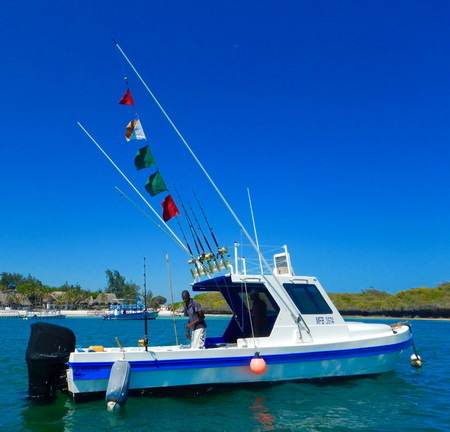 Our 2nd boat is a custom built 28 foot outboard powered vessel based on the popular Yamaha skiff design. She is ideal for smaller groups who want a half or full day inshore game fishing, popping and jigging. She is powered by 2 X 140HP Suzuki 4-stroke outboards and fitted with the latest Furuno sounder with 1KW transducer and Lowrance GPS plotter. She has 2 bunks down below and a fully enclosed and protected cabin along with ample shaded seating. She has carbon outriggers, a centre rigger and a down rigger and carries full safety equipment as well as a 6 man life raft. Tackle consists of Shimano TLD 25's & 50's, Penn International 30's & 50's & Shimano Tiagra 50's. 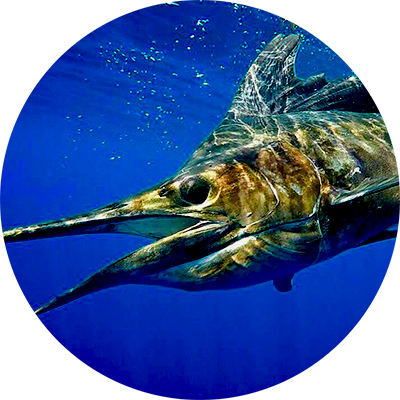 We troll Pulsator and Fathom lures and have a huge selection of colors and designs to choose from. 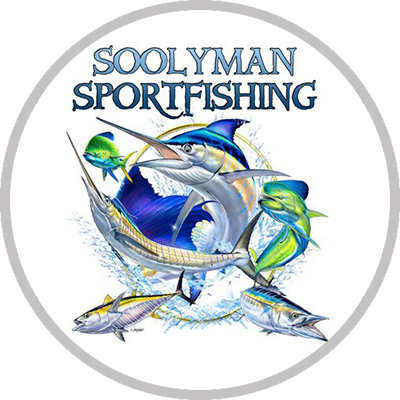 Pls note that we do not provide jigging or popping or fly fishing gear.